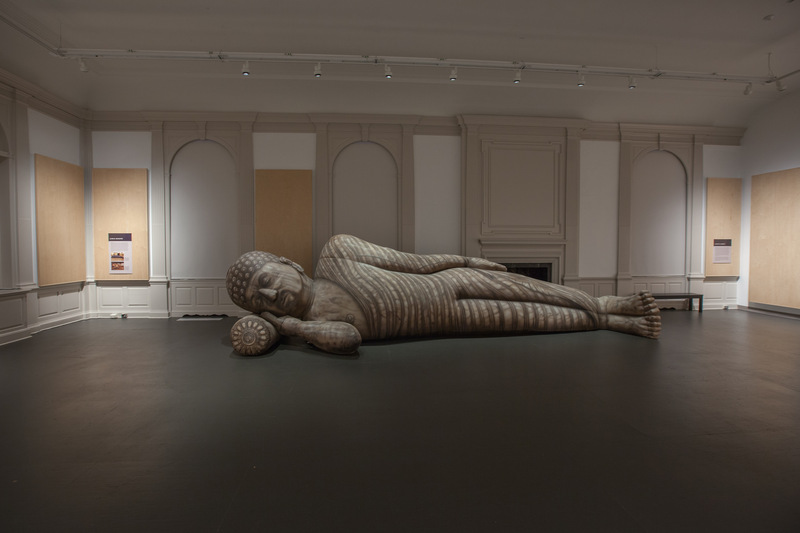 Lewis deSoto’s Paranirvana (self-portrait) is a 26-foot long sculpture influenced by the artist’s engagement with Buddhism. 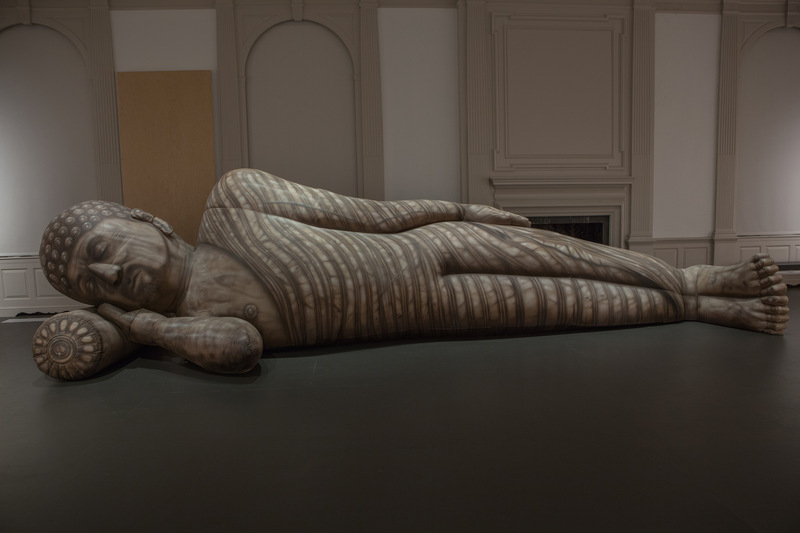 The sculpture depicts a figure reclining on its right side; its disposition closely based on a twelfth-century stone Buddha at Gal Vihara in Sri Lanka. Unlike its solid stone predecessor, deSoto’s work, made from painted polyethylene cloth, is hollow, filled only by air from a fan that keeps the sculpture inflated. The resemblance to the reclining Buddha is nonetheless remarkable, from the curls of hair to the folds of the robe, the one exception being that deSoto superimposed his own facial features, complete with goatee, on this Buddha. These alterations to material and the personalization of the piece that occurs when it becomes a self-portrait, make particular claims on this representation and shape its possible meanings. deSoto was born in San Bernardino, California in 1954 to a Latina mother and a Cahuilla (Native American) father. Raised a Roman Catholic, the artist has been a student of Buddhism for more than thirty years. Initially he studied philosophy at University of California, Riverside where a professor who was formerly a Jesuit priest encouraged him to learn more about Buddhism and Hinduism. deSoto decided to minor in religious studies as a complement to his studio art major. He also did coursework with Buddhist scholars Francis H. Cook at Riverside and Masao Abe at the Claremont Graduate School where he completed his MFA in 1981. He has been a professor of art at San Francisco State University since 1988. His body of work ranges across many media. He has often created culturally-specific and site-specific installations, transforming spaces through light, audio, and video technologies. As a conceptual artist, he generally works with immediately recognizable objects, altering their meaning in exhibition settings. From afar, deSoto’s inflatable Buddha gives a trompe l’oeil effect with its gray-blue hue mimicking stone.4 Upon closer observation, creases in the seams of the cloth are evident. Also, the sculpture makes noise—a hum emanates from the fan inflating it. deSoto purposely added sound, giving it breath.5 In Buddhism, a mindful breath is an essential part of practice. Buddha taught, “Breathing in, I see the earth element in me. Breathing out, I smile to the earth element in me.”6 Breath is a sign of life and connects living beings to the lived universe. Although hidden from view, the fan is an important component of Paranirvana. Symbolically, it provides life—and death—to the sculpture. The sculpture arrives at a venue rolled in a small crate. As the sculpture lies flat on the floor, the fan rouses movement and brings it shape, slowly filling every cubic inch with air. When fully inflated, Paranirvana rises to a height of six feet and spreads to occupy twenty-six feet in length. Once the fan is unplugged, the air seeps through an opening in the back. deSoto describes that moment as “its last…breath.”7 Its end is peaceful; the head falls deeper into the pillow and the body gradually flattens. The sculpture reaches full deflation in thirty minutes with every part sinking into the ground. The breathing cycle of Paranirvana through inflation and deflation is essential to the work and has become an event itself. When the sculpture traveled to Chicago’s Loyola University Museum as part of the group exhibition, “The Missing Piece: Artists Consider the Dalai Lama,” the museum invited visitors to watch it deflate and return for its re-inflation on December 1, World AIDS Day.8 Curators and educators staged Paranirvana, in this context, as a symbol of remembrance and hope for those living with or lost to HIV/AIDS. The re-inflation embodied concepts of presence and rebirth, appropriated from Buddhism. En route to one of its final destinations, the entire “Missing Peace” exhibition became the subject of controversy. The Brukenthal Museum in Sibiu, Romania, received requests from Chinese officials to cancel the exhibition there. Initially it seemed that the exhibition about the teachings of the Dalai Lama would be “postponed indefinitely.”10 The organizers, however, discovered that the Brukenthal was not governed by Romania but by the Evangelical Lutheran Church. Pastor Kilian Dörr of the Lutheran Cathedral of Saint Mary overturned the decision, and the exhibition was shown at the museum and the cathedral in Sibiu.11 Paranirvana took its place inside the 700-year old gothic cathedral, fantastically next to the crypt of Mihnea cel Rău, the son of Vlad III Dracula. Michelle Townsend, an exhibition organizer, remarked that, “the ecumenical message conveyed by an inflatable Buddha reclining across the floor of a church… amplified the exhibition’s message far beyond our original expectations.”12 From her perspective, displaying a sculpture inspired by the Buddha inside a Christian church exemplified the exhibition’s desire that art contributes to global peace and understanding. Another Buddhist-focused exhibition, “The Invisible Thread: The Buddhist Spirit in Contemporary Art” at the Newhouse Center for Contemporary Art in Staten Island, NY, featured Paranirvana. Novelist and critic Joseph McElroy brought an “outsider's long-time interest [in Buddhism]” to his experience of the show.13 He reported being immediately struck by the size of the 26-foot inflatable Buddha. The whirling fan, he said, reminded him to breathe as the sculpture was breathing.14 Also McElroy understood deSoto’s use of self-portraiture as the artist’s aspiration to his own “future moment of Buddhahood.”15 Zen monk Shunyru Suzuki, who popularized Buddhism in America and opened the first Buddhist monastery outside Asia, explained that, “everyone has Buddha nature” and that “the student himself is Buddha.”16 deSoto further clarifies that, “Buddha is not an idol…Buddha is not a god. Buddha is a person. He is an enlightened person.”17 By placing his face on Buddha, deSoto is visualizing his own Buddha nature. Paranirvana commemorates, even embodies, a somatic event.18 The death of deSoto’s father triggered “a feeling of shock and grief…[loss] has such a physical manifestation.”19 His father’s death prompted him to contemplate his own ideal death and to create an immense living and dying self-portrait. Drawing on his studies of Buddhism, Paranirvana encapsulated the Buddhist tenets of samsara and reaching enlightenment. Its body is a shell, but it is full of breath. As its title conveys, Paranirvana takes one last breath to reach “the great liberation” then slowly deflates into a peaceful material death. 1. Lewis deSoto, artist, personal interview, 30 June 2012. 2. Lewis deSoto, artist, personal interview, 6 March 2012. 3. Lewis deSoto, artist, personal interview, 17 September 2012. 4. The blue sculpture is the second version. The first version was produced in tan-colored cloth, and the third was in gold. 5. deSoto, 30 June 2012. 6. Thich Nhat Hanh, The Heart of the Buddha’s Teaching: Transforming Suffering into Peace, Joy, and Liberation (New York: Broadway Books, 1998), 69. 7. deSoto, 30 June 2012. 8. “Loyola University Museum of Art to Recognize World AIDS Day,” Loyola University Museum of Art, 2006, 20 June 2012 perma.cc/0pvgchJ2J7X. 9. “Paranirvana,” Vime, 2011, 20 June 2012 http://vimeo.com/26658875. 11. Darlene Markovich, co-founder of the “Missing Peace” exhibition, personal interview, 23 August 2012. 13. Joseph McElroy, “A Poetry of Transience,” Shambala Sun, March 2004, 1 July 2012 perma.cc/07jsd5naQC8. 16. Shunryu Suzuki, Zen Mind, Beginner’s Mind (New York: Weatherhill, 1999), 137, 77. 17. Kyle MacMillan, “Inflatable Buddha (with goatee) transcends traditional sculpture,” Denver Post 15 August 2003: FF01. 18. deSoto, 30 June 2012.